Jetty is a huntress of the deep ocean who finds herself fascinated by a man—a shifter—who sets anchor in her realm day after day. She is obliged to watch him, not fully understanding the fascination the handsome stranger compels within her battered heart. Recovery from major injury isn’t easy. While Drew’s physical problems have been addressed and cured, the emotional scars from his battlefield catastrophe are harder to heal. He seeks the solace of the ocean even more than the welcome company of his former military comrades in the town of Grizzly Cove. 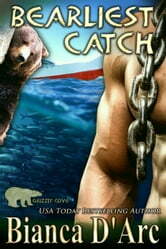 When they give him a mission to make contact with an elusive mermaid, he’s more than willing to give it a try. Jetty and Drew will have to work together if they are to bring the mer people into the protection of the cove. They will both face the terror of the deep. Will they be strong enough to overcome its evil? And will their love be strong enough to overcome the injuries of the past that have left them both slightly broken in different ways? Can't wait for thenext book, i have so enjoyed this series. I hope to see more matesmake this intoa real town. I enjoy this stories very much, D'Arc has a great way of telling them. I have read all the books in this story line, I just wish they were longer and more of the main enemy line was covered.